Site Settings in the Avid video editing system. As a long-time Avid editor, I've picked up a few tricks over the years. I've started to accumulate those tricks in the Avid Tips and Tricks series of blogs. Both Avid Tips and Tricks - Part I and Avid Tips and Tricks - Part II have been very popular, so this week is the third in the series of tips for the Avid Media Composer. The following are some more of the tricks I've picked up over the years and I hope they will be as useful for you as they have been for me. 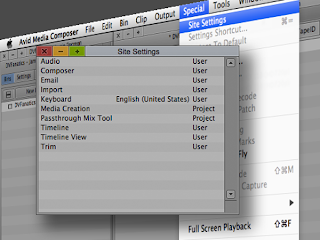 Site Settings - Tired of rebuilding all of your settings each time you create a new user on your Avid editing system? Use the Site Settings to make each of your preferred settings the default settings on the system. Under the Special menu, choose Site Settings and drag all of the settings that you would like, into the Site Settings window. Now whenever you create a new user on that system, it will use the settings you have saved. This is useful even if you're the only user on the system - I have multiple User Profiles for myself depending upon how I will be editing. For example, I have a profile for a single screen and a profile for a two screen setup. Changing just the Y rotation. 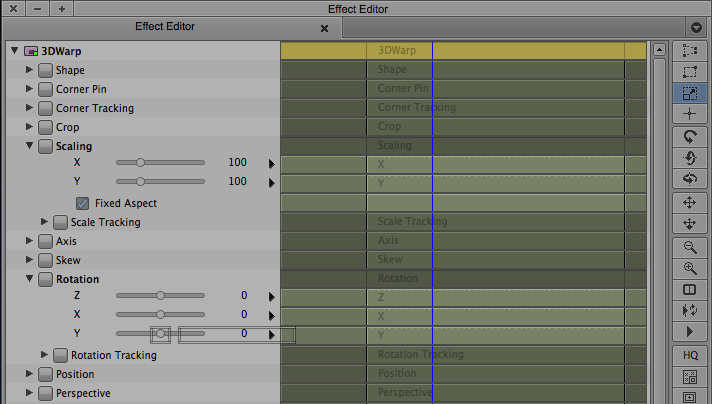 Saved Effect Parameters - Most of of you know that you can save an effect by dragging the effect icon from the Effect Editor to a bin. Did you know that you can apply just certain parameters of a saved effect? By dragging the effect icon from the bin to the slider of just the parameter you want to change, you affect only that parameter. In the case of the illustration to the right, only the Y rotation of the 3DWarp effect is changed. Resetting Effect Parameters back to Default - If the effect you're working with has a select box between the twirl down arrow and the parameter name, it can usually be reset back to its default state. By holding down the OPTION (ALT on Windows) key and clicking the select box to the left of the parameter name, the parameter will return to its original default setting. Keep in mind, not all effects have this select box. The 3DWarp effect, in the illustration above, has the parameter select box. Toggle Source/Record in Timeline key. Toggle Source/Record in Timeline - When you want to be very precise with your audio edits, use the "Toggle Source/Record in Timeline" button with a timeline view that displays audio waveforms. You will be able to see exactly where you mark the clip in reference to its audio. In my keyboard settings, I have the "Toggle Source/Record in Timeline" button mapped to the SHIFT-ESC key for easy access. Rename Track - You can rename any of the tracks in your sequence to whatever you want to call them. To do so, RIGHT-CLICK on the track you would like to rename and choose "Rename Track..." from the drop-down menu. This can help you keep the structure of your sequence organized. I will continue to post these Avid Tips and Tricks as I gather them. In the meantime, feel free to suggest your own. The complete Avid Tips and Tricks series can be seen here.